It’s the European Beer Writers & Bloggers Conference this coming weekend, and I'm looking forward to seeing friends old and new. This year we are in Amsterdam, I’ve actually been here in Holland (yes, Nord-Holland, not just the Netherlands) since Monday, and nice it is too. At least the beer isn’t as flat as the landscape, though there isn’t too much else to say about a choice of Amstel, Heineken and Hertog Jan – the latter is the local AB-InBev property, and is probably the least uninteresting of the three! 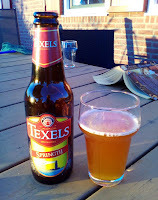 Yesterday I discovered a few more: several from Texels, plus Sanctus Adalberti which claims to be an abbey beer from nearby Egmont – until you read the label and discover it’s really brewed in Belgium (at De Proef, the contract brewery also used by Mikkeller and many others). Oh well! All were drinkable, although none really stood out. I will try a couple more of the Texels when I get the chance though, as they show promise. Lots of excellent Dutch beer to be had in Amsterdam these days - totally transformed over the past few years. Have you been to 't Ij yet? We are staying about an hour's bus ride from Amsterdam, so I've not been anywhere much there yet, but I know we are set to meet some excellent beer and brewers over the weekend. We also have a visit to Jopen - I did also pick up some of their bottles yesterday, but haven't opened them yet. If you're going to Jopen at the kerk (as opposed to the new set-up on the industrial estate) try and make time to get to the Uiltje Craft Beer Bar on Zijlstraat. Het Uiltje very highly regarded and brewer Robbert Uyleman was a brewer at Jopen and cuckoo-d there to make his own beers until relatively recently.